This morning I put a tape measure around Jumbo. It is still growing. Putting on about 8 pounds a day right now with less than 3 weeks left to grow. The pumpkin is 89 days old right now, so that kind of growth is pretty good this late in the game. 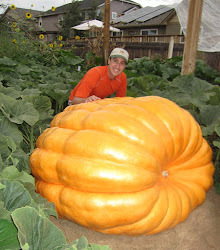 A typical pumpkin will grow 90-100 days. I'm hoping for 108 days of growth but it may be a bit much to ask. Jumbo has surpassed the mark of the biggest pumpkin I've ever taken to the scale that wasn't damaged. It should surpass the 2nd biggest pumpkin I've ever taken to the scale that was damaged by the end of this week. If this pumpkin would stay on its current growing curve, continuing to grow right up to the weigh-off and go as heavy as mama did (which was really heavy), it would still come up short of the biggest damaged pumpkin that I got to the scale. The last four days I pretty much ignored the pumpkin patches. Here in Midway I was asked to help manage the largest booth at Swiss Days and that has consumed all my time. Did a drench of fish and potassium with a touch of humic acid around the stumps this morning. I need to get into the patch and do some weeding on Labor Day. At Swiss Days I was asked by a lot of people how the pumpkin is doing and if they could come see them. We'll have our annual pumpkin party on September 22nd. That evening we'll pick the pumpkin off the vine. If you would like to attend, please let me know. The only requirement is that you have to bring your favorite pumpkin dish. We'll cut the pumpkin off the vine that evening and get it loaded up on a trailer for the weigh-off at Thanksgiving Point the next day.